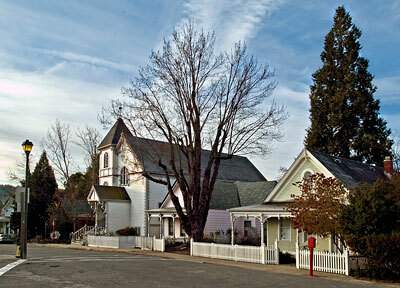 The Nevada City Methodist Church was the first denominational church in Nevada County. Founded by the pioneer preacher Reverend Isaac Owen in 1850, the church was originally located a bit farther up the hill in the Pioneer Cemetery. It was moved to this site in 1852, burned to the ground in the 1856, rebuilt afterwards and reburned to the ground in 1863. The present structure was rebuilt and dedicated in 1864, and has been in continuous use since that time, except for periods of brief remodeling after other lesser fires.